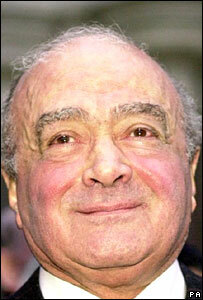 Mohamed Al Fayed's plans to open a hotel on an oil rig in the North Sea received a boost after two oil companies signed up for the project. The Harrods owner wants to create a 50-bedroom country-house style hotel on a platform in the Cromarty Firth, off Scotland's east coast, by 2008. If approved, the attraction would also boast a visitor centre, a shop and a restaurant. Two unidentified oil companies have approved the use of their platforms. Mr Al Fayed has been working alongside local enterprise agencies for several years to get the estimated £10m plan off the ground. He already owns the 60,000-acre Balnagown Estates in Easter Ross and the Falls of Shin visitor centre in Sutherland. Gordon Robertson, manager of the tycoon's Highland estate, said: "This wouldn't work without an oil company coming on board and I'm delighted to say that two companies have given their approval. "It's definitely going ahead now." It is understood the platform would not be available until at least 2008. The idea is to build a complex with a unique location, offering panoramic views and the chance for guests to watch marine life from their window. Mr Robertson said there were "various options" surrounding access to the hotel. It may be moored to a jetty, avoiding the need for a boat or a costly helicopter trip. "It's got to be special but available to anyone," he said. "We believe it's a fantastic idea and a huge opportunity for the oil companies to put something back into the area. "The exciting thing, from our point of view, is that it's just so unique. I really can see people coming from all over for the experience." A committee will now be formed to develop plans further, including members of Ross and Cromarty Enterprise, one of the partners of the project.